of all foreign exchange transactions concluded by them. 2. Where there is no transaction to report during a particular period, a NIL return/statement should be submitted. These returns/statements are of great importance to the Bangladesh Bank. Therefore, care should be taken by the Authorised Dealers to ensure that all transactions are correctly reported and the relative forms are properly filled in. The Bangladesh Bank will take a serious view of the failure of any branch of an Authorised Dealer to furnish returns regularly or promptly as well as of irregularities, if any, detected in the operations of any branch and where it deems fit, it may direct the Authorised Dealer concerned to refrain from transacting foreign exchange business by the branch concerned. Transactions in respect of export bills negotiated by Authorised Dealers should be reported as purchases only at the time entries are made in the currency account duly supported by EXP Form. Sometimes Authorised Dealers also purchase export bills drawn on collection basis. Transactions relating to such export bills should be reported as outright purchases against ”Exports” in the summary statement after the transactions are put through the currency account on receipt of advice of realisation of the export proceeds. DDs and MTs etc. ; In other words, purchases in respect of DDs and MTs etc. shall be reported only when the transactions are put through the currency accounts. Sales on account of import bills under LCs/contracts shall be reported when the transactions are put through the currency account on receipt of import documents and not on the basis of retirement of bills by the importers. All sales on account of imports are requi LOADSTAR INSPECTION SERVICES CO red to be supported by the original copy of the IMP Form. In view of the time lag between the date of receipt of the import bills and the date of their retirement by the importers it may not be possible to submit original copy of the IMP Form duly signed by the importers. In such cases, Authorised Dealers should fill in the quadruplicate copy of the IMP Form and submit it along with the relevant schedule and the summary statement. The original copy of the IMP Form should be submitted after it has been signed by the importer. With regard to import bills received on collection/CAD basis, the transactions will be reported on Schedule E-2 supported by original IMP Form. Transactions relating to DDs and MTs issued by the Authorised Dealers should also be reported only at the time entries are made in the currency accounts. Transactions in non-resident Taka accounts of foreign banks and correspondents including barter accounts shall also be reported by Authorised Dealers. Authorised Dealers will give code numbers for all receipts as well as payment transactions on the relevant forms as also in the columns provided in the relevant schedules, including stubs given on the right hand top of the schedules relating to “Period”, “Authorised Dealers” and “Currency”. Authorised Dealers shall report to the Bangladesh Bank particulars of all their foreign exchange transactions, i.e., all outward and inward remittances effected, whether through their accounts in foreign currencies or through the Taka accounts of nonresident banks. For this purpose, Authorised Dealers must submit to the Bangladesh Bank monthly summarised statements of their transactions in each currency in which a position is maintained by them and also monthly summary statement of transactions effected on the Taka accounts of non-resident banks. Statement S-1 : For reporting transactions in all foreign currencies other than for transactions with ACU member countries. Statement S-4 : For reporting transactions in Taka accounts of non-resident bank branches and correspondents held by Authorised Dealers. Statement S-6 : For reporting transactions of sales and purchases of approved foreign currency notes. This statement shall be submitted in duplicate alongwith the usual returns as per prescribed proforma. Statement S-9 : For reporting transactions in foreign currency accounts of resident corporate entities. Statement S-10 : For reporting transactions of the units of EPZ territory through ADs. Statement S-12 : For reporting transactions of Money Changers (Para 25) [To be submitted by ADs on behalf of the money changers]. Statement S-13 : For reporting transactions in foreign currency accounts of other resident entities. Combined headings have been provided to facilitate preparation of Schedules O & P in respect of transactions of branches who do not maintain independent currency positions but operates on the foreign currency accounts of the head/principal office/another branch, and themselves submit unbalanced summary statements to the concerned Area Office of the Bangladesh Bank. In cases where EXP Form is certified against purchase of foreign currencies or debit to non-resident Taka account, the transaction must be listed on a relative Schedule A-1 in triplicate showing the number of the EXP Form and the amount. (a) Advance receipts for goods to be exported. (b) Where the duplicate of the EXP Form has already been lodged with the Bangladesh Bank and the triplicate is not available at the time when proceeds are received. If an advance remittance is received for an export, the Authrorised Dealer must make out an Advance Receipt Voucher. When the EXP Form is ultimately made out and a deduction shown for the advance receipt, the date of the Advance Receipt Voucher must be stated on the EXP From. Schedule A-3/O-3 has been solely designed to incorporate figures pertaining to purchase of foreign currency against exports to Myanmar under Bangladesh-Myanmar Border Trade Arrangement. The Authorised Dealer Shall attach this schedule with a separate summary statement S-1. Currency purchased against convertible foreign currencies is to be listed on Schedule B. Separate schedule must be made out for each currency of which the name must be written on schedule and be attached to the relative S-1, S-2, or S-6 statement. Sales of currencies within the banks should be in accordance with conditions/ restrictions as prescribed by the Bangladesh Bank from time to time. Currencies purchased from other Authorised Dealers or branches in Bangladesh maintaining a separate currency position must be listed on Schedule C. A Separate schedule must be made out for each currency of which the name must be written on the schedule and be attached to the relative S-1, S-2 or S-6 statement. Foreign currencies purchased from and sold to the Bangladesh Bank must be entered on Schedule D and totals entered on the relative summary statements. (1) IMP Forms on Schedule E-2. (2) TM Forms on Schedules E-3. (3) No form is required for Schedule E-5. Currencies sold against purchases of other foreign currencies is to be listed on schedule F. Separate schedule must be made out for each currency of which the name must be written on the schedule and be attached to the relative S-1, S-2 or S-6 statement. Purchases of currencies should not breach the conditions/restrictions prescribed by the Bangladesh Bank from time to time. Currencies sold to other Authorised Dealers or branches in Bangladesh maintaining a separate currency position must be listed on Schedule G. A separate schedule must be made out for each currency of which the name must be written on the schedule and must be attached to the relative S-1. S-2 and S-6 statements. Currencies bought against credits to non-resident bank Taka accounts must be entered on Schedule H. A separate schedule must be made out for each currency and attached in duplicate to the relative summary statement S-1 or S-2 and total amount of currency shown on the schedule must agree with item 4 on the purchase side of the relative summary statement while total of Bangladesh Taka figures must agree with the totals of item 4 on credit side of S-4 statements. All ‘C’ forms must be listed on Schedule J, a separate list being made for each currency. The schedules must be attached to the relative S-1, S-2 or S-4 statements and the totals on the schedule must agree with those entered in the statements. For every item appearing in the Schedule, a ‘C’ Form must be attached. 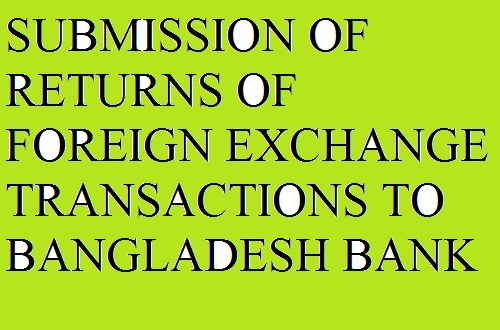 In cases of encashment of foreign currency instruments by Foreign Missions in Bangladesh, the name of the Mission concerned should invariably be mentioned on the C Form. Authorised Dealers must carefully, note that Schedule J is to cover items OTHER THAN RECEIPTS FOR EXPORT. Export receipts are to be included under Schedule A and not under Schedule J. The voucher is designed to collect details regarding inward remittances. Authorised Dealers should give information in respect of “Purpose” as clearly as possible. In cases where remittances are similar as to “purpose”, “Country of origin” and “Currency” in which payments have been received, the Authorised Dealer may pass one combined entry on the voucher. Debits to non-resident bank Taka Accounts covering transfers to other non-resident bank Taka Accounts must be listed on Schedule L and the total amounts of Taka must agree with the total on S-4 statement, The schedule should be submitted to the Bangladesh Bank in duplicate with the relative summary statements. Debits to non-resident bank Taka Accounts against sales of foreign currencies must be listed on Schedule M and the total must agree with the amount entered on S-4 statement. Thus, for example, if US Dollars are sold to a US bank against debit to that bank’s nonresident Taka account, the US Dollar will be reported against item No. 4 on the sales side of the S-1 statement for US Dollar. The schedule should be submitted to the Bangladesh Bank in duplicate with the relative summary statements. The closing balances of the non-resident bank Taka Accounts must be listed on Schedule N. They should be grouped according to countries or currency groups. The final total must agree with the amount entered for closing balance on the S-4 statement. Branches that do not maintain independent currency positions but operate on the foreign currency accounts of their head office/principal office/another branch are required to submit to the Area Office of the Bangladesh Bank unbalanced summary statements S-1, S-2 etc. Their transactions eventually reflect in the relative currency accounts although not in the same reporting period. The transactions on account of branches booked in the currency account are reported on schedule O & P.
Credits to non-resident bank Taka accounts covering transfers from other non-resident bank Taka accounts must be listed on Schedule R and the total amounts of Taka must agree with the total on S-4 Statement. The schedule should be submitted to the Bangladesh Bank in duplicate with the relative summary statements. The opening and closing balances are to be taken from the currency accounts in the books of the Authorised Dealer. Authorised Dealers are asked not to include their holdings of foreign currency notes in the balances reported on the S-1 and S-2 statement and they are to omit their transactions in currency notes completely except where such transactions result directly in entries on their currency accounts. The Statements being dispatched to the Bangladesh Bank should be put in separate envelopes or packages, i.e., each of the S-1, S-2, S-4, S-5, S-6, FCS-7, EFCS-8, S-9, S-10, S-11, S-12 & S-13 statements separately. Deposits to and withdrawals from the foreign currency account shall not be included in the usual Summary Statements viz., S-1, S- 2 etc. of the Authorised Dealers. Withdrawals made from these foreign currency accounts for payment in Taka in Bangladesh should, however, be treated as inward remittance and, therefore, the amount involved should be shown as purchase in the usual summary statements viz., S-1, S-2 etc. 11. REPORTING OF TRANSACTIONS OF PERSONAL FOREIGN REMITTANCES AND TRANSACTIONS IN FC ACCOUNTS OF BANGLADESH NATIONALS WORKING ABROAD. For reporting personal foreign remittances of Bangladesh nationals working abroad and transactions under foreign currency accounts of such Bangladesh nationals, head offices of Authorised Dealers shall submit separate monthly Summary Statements FCS-7, by 10th of the following month. The figures reported in summary statements must be supported by Schedules FCR-1, 2, 3 etc. and FCP-1, 2, 3, etc. alongwith relevant IMP, TM Forms. (1) Monthly Summary Statement EFCS-8, containing all transactions made under the exporters’ foreign currency retention quota accounts shall be prepared and submitted. In order that exports or other invisible earnings/imports or other invisible payments of EPZ entities are separately accounted for, the Authorised Dealers shall open Notional Account of EPZ’ for their EPZ constituents to which all foreign currency receipts/payments of the EPZ constituents will be credited/debited. Deposits into/withdrawal from the Notional Account shall not be taken into the regular exchange position of the Authorised Dealer. EPZ shall be treated as a separate economic territory. A separate country code 2998 has been assigned for EPZ, under which all foreign currency transactions with EPZ entities (between EPZ and Bangladesh) shall be reported. For the transactions of various nature, appropriate existing codes should be used. Authorised Dealers should maintain separate register/ledger for foreign exchange transactions with EPZ entities. 1. (a) For reporting transactions of EPZ constituents, ADs shall use Summary Statement S-10. S-10 shall be used for reporting transactions of EPZ entities with abroad, Bangladesh, within the EPZ and other EPZs through ADs. The Statement shall be printed in light yellow coloured paper. (b) Off-shore Banking Units (OBUs) shall use Summary Statement S-11 for reporting transactions with EPZ constituents. S-11 shall be used for reporting transactions of EPZ entities with abroad, Bangladesh, within the EPZ and other EPZs through OBUs and it shall be printed in yellow coloured paper. (c) The schedules for reporting transactions of EPZ entities (by ADs/OBUs) shall be A-1, A-2, J, E-2, E-3 etc. (d) For reporting of exports, imports, other receipts/payments supporting documents like invoice with Forms EXP, IMP, TM, C shall be attached where applicable. (e) For reporting of ACU transactions in S-10 & S-11, ADs & OBUs shall use ACU currency code 98 for reporting ACU transactions in ACU Dollar and 47 for reporting ACU transactions in ACU Euro. 2. For transactions of EPZ units with Bangladesh through ADs/OBUs, a country code 9999 has been assigned for Bangladesh under which all transactions with Bangladesh shall be reported.